Implement a small blockchain in R and learn more about what a blockchain looks like and some of the core concepts behind it! Everybody is talking about cryptocurrencies now - thanks to the hype about BitCoin. Much more interesting than whether there is a BitCoin bubble or not is the question how this technology actually works and what it is capable of. The story of Bitcoin started with a whitepaper called "Bitcoin: A Peer-to-Peer Electronic Cash System" in 2008. In this paper the author by the name Satoshi Nakamoto (there is still a large debate over who Satoshi really is) introduces a new, revolutionary technology and idea: an decentralised electronic currency that runs on something called the blockchain. The idea spread from this point and can be applied to many other areas now. I first got introduced to blockchains at a meeting of the BlockchainSociety at Oxford. Everybody there seemed very excited about the potential of this new technology. And to be fair, it does sound intriguing: A decentralised, incorruptible database of monetary transactions, contracts or whatever you like (for example, un-hackable voting machines). The promise of the blockchain to the crypto community is that it will disrupt entire industries by revolutionising trust in a way that we won't need any third parties like banks or lawyers anymore - we just need the power of cryptography. While the basic idea is quite intuitive, the question how blockchains actually work on a technical level is a bit harder to understand. Last week I came across this article on R bloggers, where BigData Doc builds a blockchain entirely in R. A blockchain built in R might not be the most efficient and practical thing in the world but it is a great way to understand the programming and crypto principles behind it. I wanted to understand it as well and that's why I implemented a smaller version of the blockchain in R: "If you can code it, you certainly understand it". Let's say your goal is to store some data in a secure way. To this end, you first store the data in a container - which you call a block. In the case of BitCoin, each block contains several financial transactions. When there are new transactions (or there is new data) a new block will be created and will be added together with previous blocks to form a chain - the blockchain. Let's take a look at how blockchains are making use of cryptography to become virtually un-hackable. Before you can start building the blockchain - a.k.a. chaining different containers with data together - you need to get to know two more concepts: Hashing and Proof-of-Work-Algorithms. In this case, you not only input information about the block (index,timestamp, data) to the hash function, but also the hash of the previous block. This means you can only calculate the valid hash if you know the hash of the previous block, which is created using the hash of the block before and so on and so forth. This provides you with an immutable, sequential chain of blocks. If you would alter one block afterwards you would have to calculate all the hashes for the sequential blocks again. #Function that creates a hashed "block"
If there is a lot of information that must be stored in the blockchain, you will need to create a lot of new blocks. In many cases, you want to control how many new blocks are created. In the case of cryptocurrencies for example coins would lose their value if there is an infinite amount of coins that can be created every second. Therefore, we add a so-called "Proof-of-Work" (PoW) algorithm which controls the difficulty of creating a new block. "Proof" means that the computer has performed a certain amount of work. In practice the goal is to create an item that is hard to create but easy to verify. I will use the following "task"as a PoW: find the next number that is divisible by 99 and divisable by the proof-number of the last block. For blockchains like BitCoin or Ethereum the job of creating new blocks is done by so-called miners. When a new block has to be created, a computational problem is sent out to the network. The miner which solves the PoW problem first creates the new block and is rewarded in bitcoins (this is the way new BitCoins are actually created). This "lottery" of finding the new correct proof ensures that the power of creating new blocks is decentralised. When a new block is mined it is sent out to everybody so that every node in the network has a copy of the latest blockchain. The idea that the longest blockchain in the network (the one which "the most work was put into") is the valid version of the blockchain is called "decentralised consensus". In the case of BitCoin the PoW problem involves the problem of finding numbers that generate hashes with a certain amount of leading zeros (the best explanation I found is this video from Savjee). 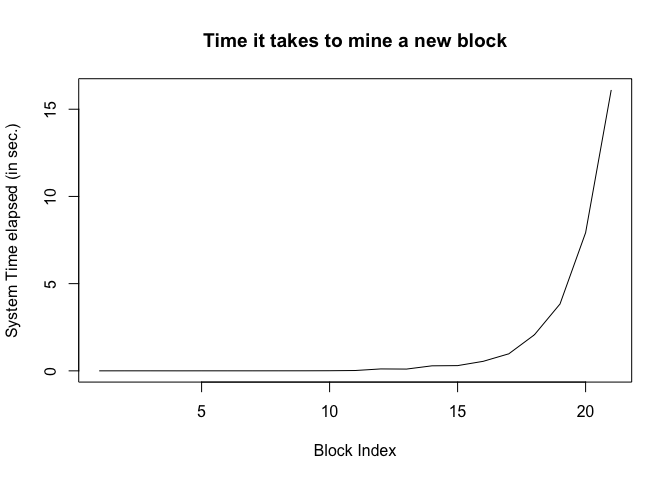 To account for increasing computational speed and varying numbers of miners in the network the difficulty of the PoW can be adjusted to hold the time to create a new block constant at around ten minutes. Before you start building your blockchain, you need to start the chain somewhere. This is done using a so-called Genesis Block. It contains no data and arbitrary values for proof and previous hash (as there is no previous block). Now you can start building the blockchain. You start with the Genesis block and then add a few blocks using a loop. If you want to add many more blocks, you notice that it takes increasingly more time. The reason is that the proof number increases exponentially. For cryptocurrencies like BitCoin this would be a problem as the time to create a new block should me more or less constant (around 10 minutes in the case of BitCoin). Therefore the difficulty of PoW has to be adjusted continuously to account for increasing computational speed and varying numbers of miners in the network at a given time. ##  "this is block 5"
In this little post, you created the tiniest blockchain. The main goal was to introduce how a blockchain looks like and introduce some of the core concepts behind it. Understanding the genius application of cryptography really shows why people get so excited about the possibilities of the blockchain. To put a blockchain into production much more work is needed: Set up an API, create wallets, digital signatures using public-private-key-pairs etc. I also only scratched the surface on the concept of decentralised consensus which is at the heart of the blockchain network. This little introduction draws on the blog post of Gerald Nash who implemented the "tiniest blockchain" in Python. I implemented it in R and added the PoW implementation from Daniel van Flymen. To dive deeper into the topic of blockchains I recommend the brilliant, orginial whitepaper on BitCoin from Satoshi Nakamoto and the blog post from BigData Doc. If you have any thoughts or responses to this blog post, feel free to reach out to me on Twitter: you can find me at @jj_mllr or check out @CorrelAid, a network of young data analysts that wants to change the world with a more inclusive, integrated and innovative approach to data analysis.